Me and U-2: My Affair With Dragon Lady describes the time from 1958 to 1966 that I worked on the U-2 as a young Air Force camera repairman with Strategic Air Command's 4080th Strategic Reconnaissance Wing (Light). The 4080th was the first Air Force unit to fly this unique, mysterious, and now-historic airplane operationally as "Project Dragon Lady." It was designed by a small cadre of wizards led by an aeronautical genius known as Clarence L. "Kelly" Johnson at Lockheed Aircraft Company's "Skunk Works." The U-2 was originally designed for the Central Intelligence Agency as an espionage aircraft to gather photographic intelligence over the Soviet Union. However, the Air Force found the U-2 to be a perfect airplane for peripheral rather than direct espionage missions over denied areas. The first use of the U-2 with the Air Force's 4080th SRW was for upper air weather sampling and domestic reconnaissance research missions. In 1962 the 4080th used both Air Force and CIA U-2s during the Cuban Missile Crisis and were the first to find Soviet offensive weapons on that island a short ninety miles from the United States. It went on to cover other "hot spots" such as Vietnam, the Middle East, and other highly volatile areas. Today, second- and third-generation U-2s are the primary air-breathing intelligence gathering aircraft since the unfortunate grounding of another of Kelly's fabulous designs, the SR-71 Blackbird. Me and U-2: My Affair With Dragon Lady is formatted in three sections: Book I, "In The Beginning," Book II, "Dragon Lady's Cuban Affair," and Book III, "Tales and Myths About Dragon Lady." Book I begins with "Espionage---The Art of Military Intelligence" which provides an overall description of the evolvement of espionage throughout the ages. "Black Knight" is a chapter that talks about the little-known Martin RB-57D long-winged reconnaissance airplane that was used in the interim while the U-2 was being designed and built. "Dragon Lady---The Dream" describes how and why the U-2 was developed in the first place and the problems Kelly Johnson and his people had to solve to make it real. "Dragon Lady---The Reality" tells how the U-2 was finally built and ends with her first flight. "Eyes and Ears of Dragon Lady" gives an in-depth description of the intelligence gathering equipment that would eventually be flown in the U-2. "Dragon Lady and the CIA" and "Dragon Lady Joins the Air Force" are chapters that tell how the CIA and, later, the Air Force came to fly the U-2 operationally. "Mishap" relates the unfortunate downing of Francis Gary Powers over the Soviet Union in 1960, thereby bringing to a close the CIA flights over the Soviet Union. Book II begins with chapters titled "A Man Named Fidel" and "Nikita the Bear" which recount the rise to power of Fidel Castro in Cuba and Nikita Khrushchev in the Soviet Union. "Crisis" details the beginning of the Cuban Missile Crisis and how Khrushchev and Castro conspired to put offensive inter-range and inter-continental ballistic weapons systems on Cuban soil and aimed at the United States. "Bringing in the Sheaves" talks about two courageous 4080th U-2 pilots, Major Steve Heyser and Major Rudoph Anderson, and how they were the first to actually photograph the missiles on Cuban soil. "Dragonfire" narrates the evolution of the crisis and how the 4080th endured the effort and managed to control events through the use of the U-2s high-altitude reconnaissance flights over the island. It also details how things that were thought could not be done with the U-2 were done successfully during the crisis. "The Dragon Slayer" is a chapter dedicated to the only direct casualty of the crisis when Major Rudolph Anderson, one of the first U-2 pilots to find the missiles, was tragically lost on October 27, 1962 at the height of escalation of the crisis. "Consummation" tells how the Cuban Missile Crisis was brought to a very speedy end after the loss of Anderson. Book III begins with a chapter titled "The Mother of All Myths." It tells how, when somebody thought they learned something about the U-2 that they believed to be true that was, in fact, NOT true, believed every word they heard. Also, it describes how we Dragons of Project Dragon Lady invented "facts" that were not true so that the truth could be kept undercover. It is also the basis for all the other chapters in Book III. "Crowflight and El Loco Oscar" outlines the first operation the Air Force U-2s had, that of upper air sampling for detection of radioactive particles left from fallout from nuclear weapons testing. 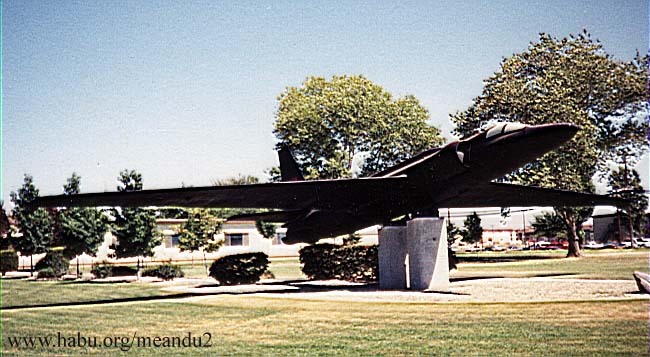 "Delta Dragon" describes an episode when a few other Dragons and I misled a non-project "know-it-all" into believing that the U-2 could be outfitted with a delta wing and converted overnight into a supersonic fighter. We also went on to tell him the top secret (at that time) reason we were at the base, which was weather sampling, and he would not believe it. "The Grey Ghost Turns Black" is a story about U-2 #66681 and how it was painted black for only one flight and what the repercussions of that flight were for us. "Yellow Moon" is a story about how and why it took the 4080th one year to get a mission that was scheduled for only one flight. "Airman Collins and the Missing Dragon Lady" is about the loss of U-2 #66683 in 1963 in which Captain Joe Hyde tragically became the second casualty of the Cuban Crisis, although the actual crisis had ended in October 1962. "The Case of the Missing Glockenspiel" tells how a U-2 flew once without enough ballast to stay airborne, but managed to do so and how the flight was resolved. "Oscar Down Under" talks about the U-2 sampling program that was flown for about five years from Australia. "Captain Bull's Famous Flight" is dedicated to the late Colonel George Bull, a U-2 pilot that attained the 1,000 hour mark in a U-2 while in Australia. "Captain Cooper's Canadian Caper" is dedicated to retired Colonel Roger Cooper and his brave and successful efforts to bring a sick U-2 safely to a landing on a large frozen Canadian Lake. "Captain Stratton's Blue Bayou" is dedicated to retired Colonel Charles Stratton who ejected from a U-2 early one morning over a Louisiana bayou and how the story finally turned out. The last three stories are of the "hard-to-believe-but-it-actually-happened-this-way" category. The chapter "Dragon Doctors" describes the men who worked on the U-2 and what we had to endure to keep her safe, ready, and "Code 1" for flight. "Driftsight Dragon's Delight" outlines my own personal story of working with a difficult unit in the U-2 that no one else liked except me and what happened because of my times with this thing called a driftsight. The next chapter, which I consider as one of the most important chapters in this book, is titled "The Dragon's Ladies." It describes in detail what the wives and girl friends of the Dragons had to endure with our antics and how well they did it. It is dedicated to every woman who has ever had to wait for her Dragon to come home from a long extended temporary duty assignment with the U-2. The spouses of people involved with the U-2 program will be especially interested in this chapter because each and every one of them has had to live it themselves. "Epilogue: Dragon Lady, It's Been Fun" provides a narrative of the overall U-2 program to date and mentions the SR-71 Blackbird and its cruel, sad, and stupid demise because of "Pentagonian Politicians" and other "higher-ups." Finally, I end the book with an Afterword, a very short narrative of my feelings about a great lady, the Air Forces's U-2 Dragon Lady. Me and U-2: My Affair With Dragon Lady is 6" x 9" x 9/16," is in PerfectBound binding, and has 282 pages. There are twenty-seven black and white photographs in the book, some of which have never been seen before. There are eleven pages of bibliography and notes at the end of the book which I used in writing the original manuscript. Me and U-2: My Affair With Dragon Lady is a book which should be experienced by anyone involved with the U-2 program, by aviation enthusiasts who wish to know more about this fantastic aircraft, or by anyone having a curiosity to know what the real truth is about this great airplane and what it took to keep it flying during the treacherous days of the infamous Cold War. It is the first book to be written by an enlisted person who was directly involved with the U-2 program. It is the only book to date written directly, rather than "as told to" versions as many others have been authored, by an alumnus of the Lockheed U-2 Dragon Lady during the early days of the program. Me and U-2: My Affair With Dragon Lady is sold primarily point-to-point and is now being offered over the internet. Click here to obtain an autographed copy of the book.